South Korea’s Constitutional Court on Thursday ordered the revision of current laws by next year to give conscientious objectors -- those who refuse mandatory military service on grounds of conscience or religious beliefs -- the option to perform an alternative service of a civilian nature. The order was announced following the ruling which found that not providing alternative measures for the objectors is against the Constitution. The nine-judge panel, headed by Chief Justice Lee Jin-sung, announced the historic decision by six votes to three. A number of political parties and government agencies have released a statement welcoming the court’s decision, which would stop thousands of Korean men from being arrested for refusing to serve military duties, as long as they comply with an alternative service, starting 2020. “For all these years conscientious objectors have been expressing their willingness to serve their duties in alternative ways, to contribute to society in ways that they can,” said Lee Sung-ho, chairperson of the National Human Rights Commission of Korea, in a statement. South Korea, still technically at war with North Korea, currently offers no alternative to the military service required of all able-bodied men. Women are not required to serve the duties. Refusing to perform the service can lead to a jail term up to three years. This could severely hurt one’s career prospects, as most major firms here require all male applicants to share their military service status when they apply for a position. Since the 1950s, some 19,000 men have been arrested and jailed for refusing to serve in the military. The number is higher than all objectors jailed in the rest of the world combined. Altogether, the Korean men have spent more than 3,000 years in prison. Some have fled overseas and chosen to live as refugees instead. According to Justice Party floor leader Roh Hoe-chan’s office, 93 percent of all conscientious objectors worldwide are South Koreans. Indeed, the country remains one of the few democracies that criminally charges and jails conscientious objectors. The government had been arguing that introducing an alternative service for conscientious objectors would jeopardize national security and undermine social cohesion. Those who support the current conscription system stress that the Korean Constitution stipulates that “all citizens shall have the duty of national defense,” along with the duty to pay taxes, work and educate their children. They also argue that those who are not religious or pacifists may exploit laws to simply avoid military service, and eventually increase the number of draft dodgers, should the current system change. This clashes with article 18 of the International Covenant on Civil and Political Rights, which guarantees one’s right to freedom of thought, conscience and religious belief. The court, however, once again ruled that the objectors will continue to be criminally accountable. With the ruling, Korean men, including those whose religion forbids them to bear arms, may continue to be subject to jail terms should they refuse to serve the duties, at least until December next year. “While we welcome the court’s decision to revise the laws to introduce an alternative service for conscientious objectors, it is regrettable that the court has ruled that they are still criminally accountable,” said the Labor Party in a statement. 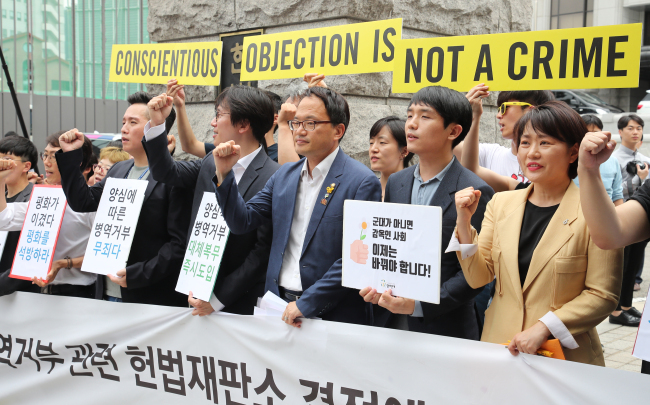 Thursday’s ruling marks the fourth time South Korea’s Constitutional Court ruled that it is not against the country’s highest law to prosecute conscientious objectors. The court has made the same rulings in three previous adjudications in 2004 and 2011. Not everyone in South Korea agrees with the idea of alternative service. “How are you going to ‘prove’ your conscience, if you don’t have any proof that you have been involved in a religious organization that does not allow you to bear arms? I think anyone can make this up,” said a Korean man in Seoul who asked to be identified only by his last name Kim. Some civic groups have argued that all individuals imprisoned solely for refusing military service on grounds of conscience must be released, and their criminal records should be cleared as well.